Choose a random mount or vanity pet at the press of a button. Companions can be weighted to be chosen more or less often, or disabled altogether. When mounting, RandomCompanion will automatically choose the best type of mount based on your location. Added new mounts from WoW 5.4. Added new mounts from WoW 5.3. Fixed a bug involving account-wide weights not being loaded correctly. Added new mounts from WoW 5.2. Fixed a few bugs with dismissing pets. Added Account-Wide weights option to Options panel. Fixed a bug with the weight sliders. Made a change to allow pre-5.1 pet weights to work again. Any pet weights set with RandomCompanion 3.1 will be lost. Added Cloud Serpent Riding detection. Added new mounts from WoW 5.1. Made changes to when reloads are handled if the pet list changes to help eliminate slowdowns. Added some missing mounts to the flying and scaling lists. Fixed the mount IDs for the jewelcrafting panthers. Changed the event that initializes RandomCompanion from PLAYER_LOGIN to PLAYER_ENTERING _WORLD. Totally re-wrote how mounts are loaded. This should allow for better control over what gets summoned under different conditions. Fast swimmer (currently only Subdued Seahorse) support has been added, but is untested. Added the ability to clone renamed pets. Fixed a bug with manually dismissing pets. Fixed several bugs with dismissing pets or re-summoning the same pet that you already have out. 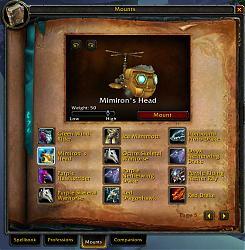 Fixed an issue where RandomCompanion gets REALLY confused when the mount list gets out of order. Fixed a LUA error when pet/mount names are not cached yet. Fixed a bug with mounts that require professions. Fixed importing mount weights from pre-WoW-5.0 versions of RandomCompanion. Removed more code that is no longer necessary. Major update for WoW 5.0...Expect lots of bugs related to vanity pets. Removed several sections of code that are no longer necessary such as zone detection and snowball detection. Removed pet cooldown detection because it's sorta broken at the moment. Added "/rc quiet" to toggle showing the full "RandomCompanion loaded" message when logging in or reloading. Added support for the Feldrake mount. Made the Corrupted Hippogryph work correctly in non-flying areas. What does "pet and mount cloning" do? How about an option when you summon a mount... RC summons a pet of similar type? Like a Nether Ray mount and Nether Ray Fry? Or a mechanical unit when a mechanical mount is summoned. A bird when a bird is summoned. It could even go by faction, so that a dragonhawk is summoned with the BE mount, or a bat with a skeletal horse. Anyway, just a thought. Lovely addon. Thanks for the help. I thought I tried something similar, but I'll give it a shot tonight. I'd much rather have a random mount, random companion in place of the rocket, but I can't get it to work. Thoughts? If you target someone who is mounted and use RandomCompanion, it will choose the same mount they are on if you have that mount as well. The same thing happens if you target a vanity pet. when I open Companions frame and looking at vanity pets, pressing rotation button (both clock-wise and counter clock-wise) only rotate the pets a little degree, and stops rotating. This happens when only one single addon RandomCompanion is enabled. I'm looking into what could possibly be causing this. It doesn't really make any sense why it's happening, but I'll get it figured out eventually. Disabled pets (and mounts) should never show up unless you manually call them. I'll have to take a look into it and see what could possibly be happening. I recently got a Guild Page. For those who don't know, it's a special vendor companion that sells any of the guild rewards items. Unfortunately, it also has an 8 hour cooldown, so it's not something that you want to summon at a random time... which is exactly what RandomCompanion is doing. I've set the Guild Page's frequency to "disabled" but he still pops up from time to time. Any way to fix that? Last edited by bill_med87 : 01-17-11 at 02:50 PM. Thanks! Working like a charm now! This is working perfectly, no instructions. The new version I just posted should fix this. Last edited by bill_med87 : 01-01-11 at 11:41 AM.